This is the second in a series of articles where we explore Intentional Peer Support (IPS) and its potential role of advancing human rights in mental health. What comes to mind when you think of human rights? For a lot of us, the idea of human rights conjures images of angry mobs, crowds marching with raised fists, loud voices, unilateral demands that will have to be paid out of somebody's pocket, and high ideals with impossible implications few of us can imagine ever being realized in the real world order of things. Even worse, the overthrow of existing regimes in the name of human rights has often resulted in new regimes that were just as bad or worse from a human rights perspective. In mental health, the popular images are equally disturbing. These days, people tend to see human rights for those of us with psychiatric labels as a literally insane preference for emotional rampages, destructive tirades and violent shootings. They would vastly prefer to adequately fund and resource the public safety mechanisms that surveil and confine us than to suffer the consequences they believe our unchecked liberties to occasion. And, dangerousness aside, no one wants their hard-earned dollars spent cleaning up someone's irresponsible mess, which is why the general public still vastly prefers Nurse ratchet's iron hand over inmate self-determination and our fledgling efforts to run our own asylums. But what on earth does relationship, connection or Intentional Peer Support have to do with any of this? Essentially it's a legal or political question, right? From one point of view, no rights are needed. From another point of view, no rights can be denied. Courts or politicians make the decision. Someone wins, someone loses. End of story. Well, I would posit that what we are seeing in the above scenarios in not, in fact, the product of a human rights paradigm - which is, in fact, highly relational and highly connecting. Rather, we are seeing the predictable results of its absence. In other words, in the absence of respect and regard for human rights, we produce a failure of relationship and a failure of connection. This leads to - and in effect causes - the conflict, disruption and worst-case nightmares that no one wants to see happen. In fact, human rights theory actually says this: "It is essential, if man is not to be compelled to have recourse, as a last resort, to rebellion against tyranny and oppression, that human rights should be protected by the rule of law." Universal Declaration of Human Rights, http://www.un.org/en/documents/udhr/. In other words, from a human rights perspective, conflict, disruption and disorder should not be reflexively dismissed out of hand as irrational or incomprehensible acts of disturbed individuals, habitual trouble-makers or social malcontents. Rather, such occurrences deserve serious consideration as a meaningful commentary on the relational status quo. There is a very real possibility that they reflect an understandable, albeit unfortunate, outcome of harmful social dynamics, communal oversights or civic disregard. Ok, so that's what happens when human rights are absent. But what do we gain from their presence? How do human rights support our relationships and connect us to each other? And, why does the same relational connection that's so important in IPS factor so heavily in human rights and how did it become so integral to their practice? The human rights paradigm was outlined in 1948 in the Universal Declaration of Human Rights, http://www.un.org/en/documents/udhr/. It came about in the aftermath of World War II in a world community still reeling from Nazi genocide, the atom bomb and possibly the greatest atrocities known to humankind. More than ever, the nations of the world wanted to find a different way forward. The human rights paradigm was that path they proposed. It represented a global commitment and common resolve to ‘never again’ revisit the turmoil and devastation of a world at war. The common challenges that, as a species, we must over come - if we are to survive. Yet, amazing as this accomplishment was, even more amazing is what they did not do. The peoples of the world had suffered tremendous losses. They had every reason to be angry, judgmental and punitive. They could easily have divided the world into good nations and bad nations, good races and bad races, good people and bad people. They could easily have designed the new world order based on winners and losers - and 'to the victors belong the spoils.' The historic precedent for this way of thinking was well-established. We have a common problem - and that is not each other. We have a common solution - and that requires each other. We are all members of a human family - and should treat each other that way. We are equal, everyone everywhere, in dignity and rights. We are all endowed with reason and conscience. In other words: our ability to make sense of experiences and to live according to deeply held values is a part of our nature as human beings. Everyone, everywhere has needs, insights, voice and perspectives that deserve respect, fair hearing and meaningful inclusion on par with others. Everyone, everywhere deserves the means to make a living and support a family. Everyone, everywhere has a right to develop and participate in the natural stream of life in the communities where they live. Our common problem as human beings is fear and want. We must address the social injustices, power abuses and resource inequities that prevent us from treating each other fairly and well. Our common solution - and the highest aspiration of humankind - is to create a world where these basic rights and freedoms are protected for all of us. They are the birthright of all people everywhere as members of the human family. 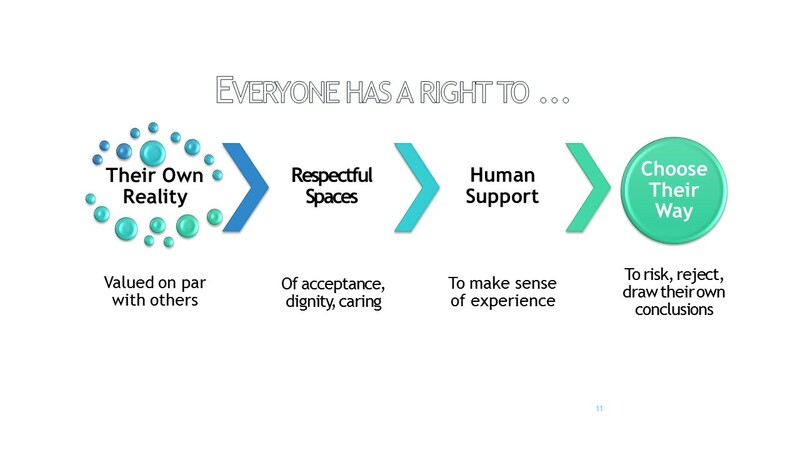 Similar to Intentional Peer Support, the human rights paradigm is relational in nature. Problems do not stem from individuals or their supposed defects. Rather, problems are inherent in the nature of being human. They arise from the common needs and aspirations that we all share. Equally important, the solutions aren't about individuals either. It isn't that one person is wrong and another right. It isn't that one group deserves rights and another doesn't. To the contrary, individual victories and siloed rights makes no sense in a human rights paradigm. The fact is, we all need the same things in order to live well and be well. We all need respect, dignity, fairness, justice, voice, participation, access to developmental resources, protection from predators and the elements, food in our bellies, a roof over our heads, clothes on our backs, the means to make a living and support a family... Few if any of us can be well without these things. Almost none of us does well - much less thrives - without them. Whenever any of us lacks these things, the likelihood is that others will suffer as well. Thus, human rights are not an individual concept. Rather, they are something we share and hold in common trust. They are protected, and can be protected, only to the extent that we 'see' each other, value each other and are committed to looking out for each other. And, this is something we can meaningfully do only in a context of mutually responsible, caring, connected (trusting and trustworthy!) relationships. Think about it. If anyone of us attempts to assert our rights to the exclusion of others, what happens to human rights? Let's say I get my rights to voice or income or housing - or even liberty, self-expression or freedom - but I don't care about what happens to you as a result. What does that mean? All too often, it means I get to do what I want without regard to the effect on you. In one fell swoop, your need for dignity, regard, fairness, respect and access to resources that you need just as much as I do just goes out the window. How is that human rights? In a word, it's not. To the contrary, unilateral assertion of 'rights' is not human rights at all. It is the same old might-is-right, survival-of-the-fittest, law-of-the-wild, power-and-privilege paradigm we have been playing out for millennia before Darwin. It has nothing to do with the shared and fundamental needs that we all hold in common as human beings. To the contrary, it distorts and thwarts the basic human rights picture for all of us. Are you beginning to see how IPS fits with all of this? Hopefully by now some of the terms from your IPS training - connection, relational care vs. individual needs, mutuality, shared responsibility, power and privilege - are starting to ring a bell. Future articles will address in more detail how these concepts work in practice with a human rights paradigm. First, the human rights paradigm requires intentional relationships. Human rights can't work unless we try to practice them. For that to happen, human beings have to become aware of certain basic common interests and the consciously decide to treat each other differently. How does IPS address this concern? Well, IPS - 'Intentional' Peer Support - is the study and practice of intentional relationships. It actually offers a way for human beings to enact the human rights concepts like mutual regard and shared rights in a meaningful workable manner. Second, the human rights paradigm requires relationships that work. There is no way that people around the world are going to treat each other differently - and keep doing so time and again - unless it makes things better rather than worse. Well, IPS - unlike conventional mental health - is the study and practice of creating relationships that really work in the real world. Through IPS, people learn how to build relationships that are actually enjoyed and valued by everyone involved. In other words, IPS offers a sustainable model for connecting human beings in ways that enrich subjective experience and quality of living all around. Third, the human rights paradigm - to ever be realized - is going to require a heck of a lot of social change. The kind of relationships that merely perpetuate the status quo, ignore the effects of power and privilege, or result in individuals or groups continuing to be used or abused is not going to hack it. Well, IPS - unlike most conventional relationship models - is about social change. That's a primary purpose and goal for the practice. It's about uncovering and examining the assumptions that keep individuals, organizations and communities stuck, and inviting new ways of seeing, experiencing and being with each other that can work for all. The next article in the series will focus more deeply on connection. We'll make the case that connection, as understood and practiced in IPS, not only supports human rights and mental health - but that it actually is human rights and mental health for all practical purposes. Thank you for articulating this! I wonder if social change starts internally? The social model of disability talks about the disability being positioned in a community that will not accommodate my difference. I wonder if I might need to start with acknowledging that the way I express myself on the outside, needs to accommodate who I really am on the inside. Some of us are better at this than others. I love that idea! It makes it all the more important (and valid) for us as a community to discover and express who we really are! Thanks for suggesting it! None of this works for me. I do not see a sense to view it through that does not make it another model of oppression. Thanks for reading and commenting. You're in good company. Tina Minkowitz - one of the foremost experts on the CRPD - had much the same reaction. Still, from my own experience, the relational mountains I've seen move in my life, if they were movable at all, were won over rather than run over. Moroever the greatest injuries I've caused -as you can well attest to - have resulted from my own tendencies to overwrite rather than listen for, regard and honor the needs and values of others on a par with my own.